Stylish, contemporary cafe chairs in a modern Zebrano finish with a strong Chrome frame. Available from stock for a free and fast delivery. Perfect for a trendy and fresh look cafe or restaurant area. 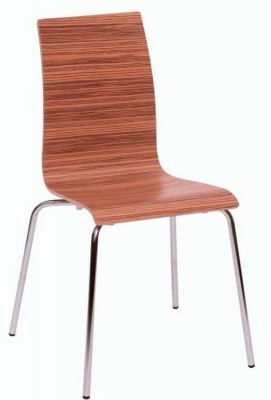 Unique Zebrano finish chair, for a stand out destinctive design in your cafe, coffee or dining space. Please contact our kowledgeable sales team for further information on Bulk orders.